I love this Farmer’s Strata with Kale, Tomato, Mushrooms, and Feta. It’s one of the foods that I could eat anytime; breakfast, brunch, lunch, you get the idea. We’ll often have it for a “Breakfast for Dinner” night in our house. It quick and easy to make making it a perfect meal for our busy life. A strata is just a fancy way of saying a layered casserole. It’s similar to a frittata or crustless quiche. In a strata, you add the ingredients in layers. As it bakes, the flavors meld together into a delicious meal. You can easily substitute other ingredients in this strata to your liking; sausage, bacon, potatoes, spinach, no cheese, etc. In this version, I used fresh parsley and cilantro. You can easily substitute other fresh or dried herbs. If using dried herbs, use 1 Tablespoon of each herb. 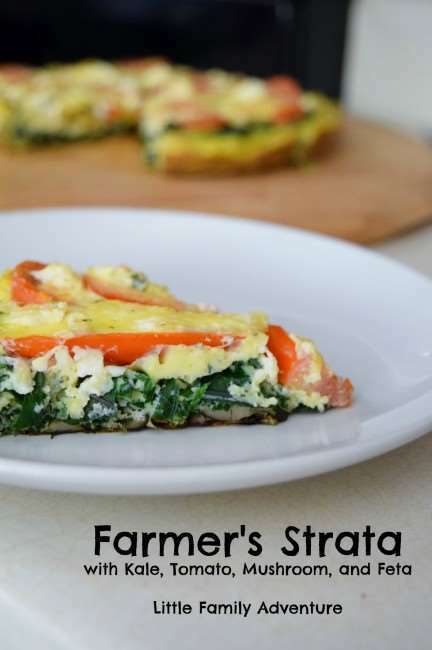 This Farmer’s Strata with kale is part of my New Food of the Week Challenge. I challenged myself to add more kale to my diet. 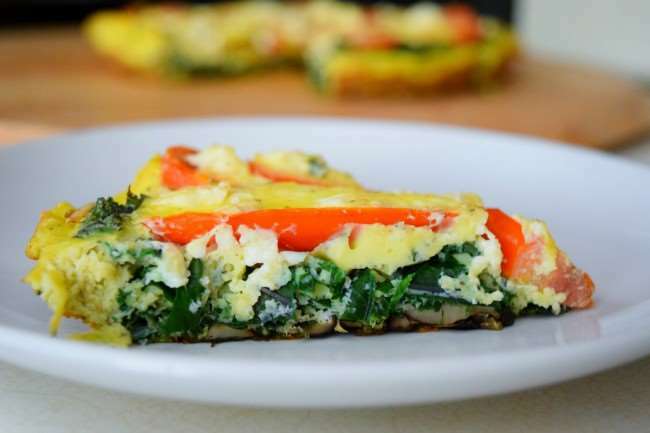 This Farmer’s Strata is a perfect way to add kale and other vegetables in a quick and easy meal. My New Food of the Week Challenge is about eating healthy and trying new foods. Kale is a versatile leafy greens that can be used in dishes like this, smoothies, soups, and more. Beat eggs, salt, and pepper, in a medium bowl. Set aside. Heat oil in a 10" oven safe skillet over medium heat. Add mushrooms, green onions, and sliced kale stems to skillet. Saute for 4 minutes. Add layer of kale to mixture. Do not mix in, just lay on top of mushroom and herb mixture. Add a layer of tomatoes over kale and sprinkle crumbled feta over tomatoes. 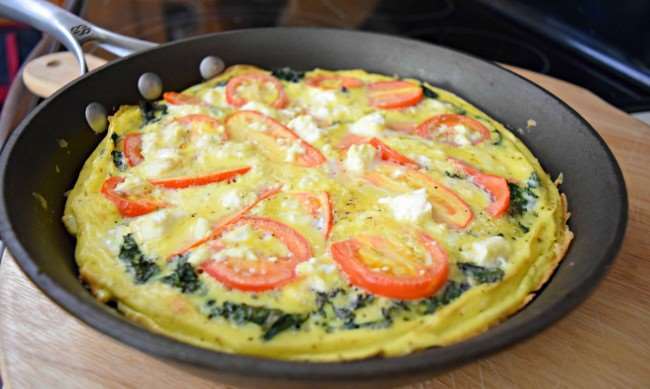 Evenly pour eggs over tomatoes and feta. Cook for 5 minutes over medium heat. As eggs are cooking, lift edges of strata with a spatula allowing eggs in fill in the gaps. Once bottom of strata begins to brown, transfer to the oven. Cook for 20 minutes, or until eggs are set. Remove from oven and take strata out of pan with a large spatula. Slice into wedges and serve. This looks great, Nicky. I am sending it to my sister, who LOVES kale. I am not a fan of kale (even though you are encouraging me to try it this week! ), but could easily substitute spinach. Thanks Gaye. 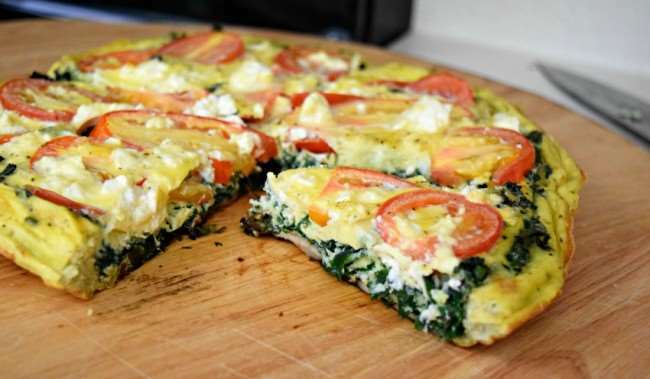 Yes, you could substitute spinach for the kale. I’m thrilled with my new camera. It’s made a HUGE difference. I just LOVE Strata- great call on the Kale- Kale is delicious in everything. Yes it is! The kale works really well with eggs. I prefer it to spinach in things like this. I don’t know if I should have seen this now, as I’m sooooooooo hungry. It looks DELICIOUS. I love the combination of products that you used. This is a delicious strata Winnie. The flavors are amazing. Thanks for pinning. I know you’re going to enjoy it. I use kale like I would spinach. I like that it holds up better throughout the week as compared to spinach. I can’t help it, I have to reply. While this sounds like a great ‘frittata’ recipe, it is not a ‘strata’ recipe. Please know what you’re posting a recipe for. Someone who doesn’t know the difference may embarrass himself/herself in presenting a dish to guests with the wrong name. Those searching for recipes on the internet need to have access to reliable sources. Why embarrass yourself by posting incorrectly. A strata contains bread as one of three primary ingredients, the other two being eggs & cheese. Lots of good recipes out there folks. If you make this one please call it a frittata. Marie, thank you for your comment. 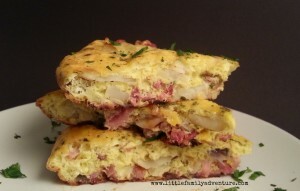 Although a strata is traditionally made with those three ingredients, there are several recipes out there using potatoes or hash browns instead of the bread.